Pain Physicians NY (Brooklyn & NYC) provides a full range of Epidural Steroid Injections (Cervical Epidural Steroid Injections) as well as advanced pain management services including marijuana treatment, electrical nerve stimulation for chronic pain among latest cutting edge procedures: Body Composition Analysis, High Tech Shockwave Therapy, groundbreaking Interstitial Laser Therapy. The cervical epidural space is the area around the neck radiating from the spinal cord. The nerves covering this area originate from the spinal cord and spread outwards to the shoulders, upper back and down the arms. An inflammation of the nerves around this area can cause pain in the neck, upper back and shoulders, sometimes moving down to the arms as a sharp pain. Most of the times, the pain is dull and can be managed by oral over-the-counter painkillers like ibuprofen or even prescription painkillers that are more powerful. Sometimes, however, even these pain relievers become ineffective, rendering the patient unable to operate or perform everyday tasks due to severe pain. In these cases, cervical epidural steroid injections are used to deliver anti-inflammatory steroids directly to the nerves and relieve the pain. What causes pain in the cervical area? Herniated disc – Discs in the spine are arranged in such a way that they can twist and bend to allow for motion. These same discs can also become degenerated with time or due to another condition or injury, causing it to break down. When that happens, the affected discs compress, causing the inner core of the spinal cord to leak out. The intervertebral discs that are damaged consequently lie upon the spinal root and apply pressure on it, causing pain in the affected area. This procedure does not require general anesthesia since it is a not very surgical and can be even done in the outpatient area. The patient needs to lie with their face down so that the back of the neck can be viewed. Then, an injection is made to the outer cervical space with a pain reliever. For these injections, a smaller needle is used because it doesn’t have to go deep into the skin. A prick will be felt as the needle gets in, but the rest of the procedure will be painless once the anesthesia starts to work. The needle is then removed. Totally the procedure lasts about 15 to 30 minutes. 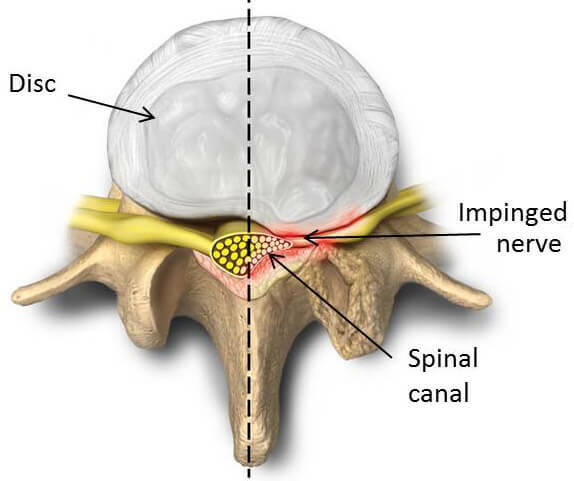 Next, the main, anti-inflammatory needle is inserted through the cervical space and directly into the spinal cavity. It’s a longer needle but you won’t feel a thing because of the local anesthesia. The anti-inflammatory steroid (cortisone) is then injected into the spinal cavity of the cervical space where it can work to reduce inflammation of the nerves. The entire procedure is done with the help of X-ray machines through fluoroscopy which guides the practitioner on the position of the needle and the spinal cord. Contrast dye is also injected into the cervical epidural space before the steroid in order to identify the intended region. Just like other injectable pain relievers, this one does not offer a permanent solution either. It is aimed at those with such severe pain that other physical therapeutic measures become unbearable thereby delaying their treatment plan. The duration of the anesthesia or the steroid depends on the requirements for the patient. However, there should not be as much pain after the injection for at least a couple of weeks, during which time other interventions can be explored. How many epidural steroid injections are needed? No studies until now have determined the number of cervical epidural steroid injections needed, nor their frequency. However, in general, doctors tend to perform up to three cervical epidural steroid injections within a year. Some prefer to perform the injections out evenly in a year, while others prefer to perform two or three cervical epidural steroid injections at two to four weeks interval. These injections are effective in about 50% of the patients. If there is just a little bit relief, one or two more cervical epidural steroid injections may be recommended. However, if no relieve is provided with the first injection, there is a big chance that further injections will also provide no relieve, so they are not recommended. Are cervical epidural steroid injections safe?